1 of 4 Heat broiler. 2 of 4 In a large skillet, heat pot roast and gravy over medium heat until heated through, about 3 minutes; thin gravy with a few tablespoons of water, if necessary. 3 of 4 Spread toast out on a broiler pan. 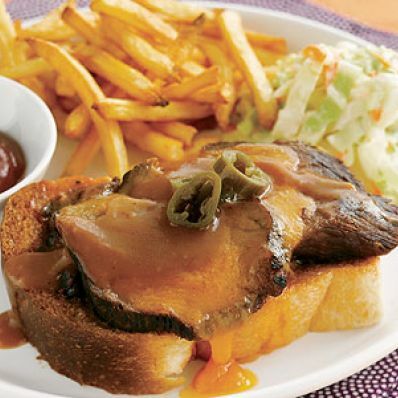 Divide pot roast slices evenly among toast. Spoon most of the gravy over the meat, and top each sandwich with a slice of cheddar cheese. Spoon any remaining gravy over cheese, then top with a few jalapeno slices. 4 of 4 Broil 1 minute, until cheese is melted. Serve with fries and cole slaw, if desired.